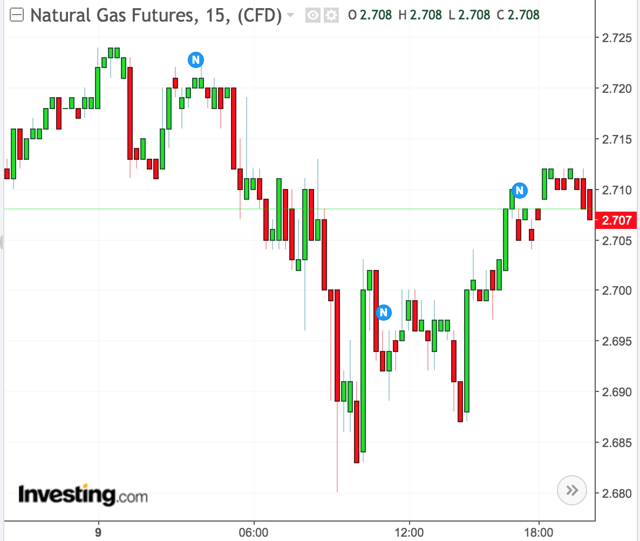 Natural gas futures trade within a tight 5-cent range between $2.68 and $2.73. Spot market edged lower led by a $0.66 loss in El Paso Permian. Money managers weigh production, export/import data, weather, and balance of demand in prime shoulder season. Forecast models trending cooler late April. Injection in each of the next 4 weeks expected to be larger than last year and the 5-year avg. Expect for natural gas prices to continue to trade within a narrow range over the next week with storm-driven bouts of warm and cool air, the potential for a cool late April, but a strong injection period (loosening market). April, which is prime shoulder season, is a time of the year when temperature variability is notorious, volatility is elusive, and the weather pattern is extremely unstable. The jet stream, a column of rapidly moving air/powerful winds some 30,000ft-39,000ft above the surface, during this time is in complete flux and very active as warmer, moister air from the south battles for position with cooler, drier air from the north. Storm systems like to travel along this channel of air as it divides the warmer air to the south and cooler air to the north. During this time of year, severe thunderstorms can be triggered due to the increase in warmth and moist air from the south, but at the same time can deliver a powerful snow storm if it comes with enough cool air from the north, such as the storm "bomb cyclone" that will Wednesday-Thursday across the central U.S.
April is a time of year when both the heat and air-conditioners are in use across the country with cooler air to the north still driving heating demand while strong enough warming to the south is driving up cooling demand. Coinciding with all of this is injection season which is kicking into full gear. This in conjunction with export/import data, production, forecast models, etc. These are all things that can weigh on the market as what happened Tuesday as investors tried to find a balance between all of these variables. After Monday's 1.73% (4.4 cent) rally to finish at $2.71, the front-month May futures contract finished Tuesday slightly lower finishing the trading day down 0.30% (0.9 cents) to $2.70. Not only was Tuesday's trading day more subdued, but also traded within a very tight 5-cent range between $2.68 and $2.73. Market participants spent the day weighing multiple variables including fluctuating model trends, export/import data, and the overall balance of demand. Figure 1 below is a chart showing the price trend of NYMEX's front-month May futures contract over the past 24 hours. 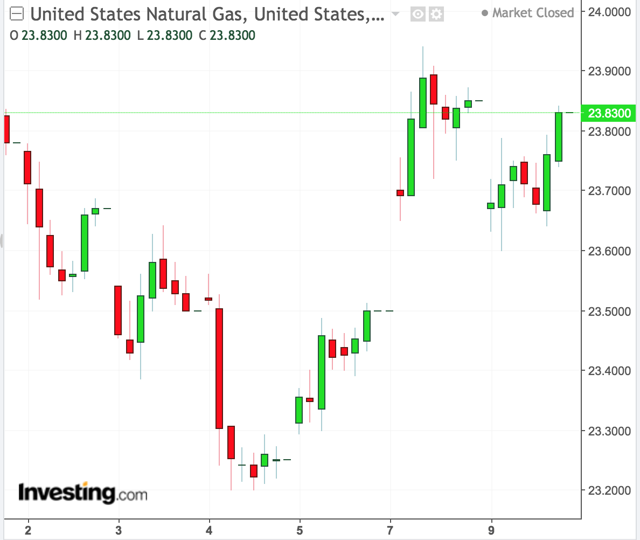 The United States Natural Gas ETF (UNG), which is the unleveraged 1x ETF that tracks the price of natural gas, finished Tuesday flat, down just 0.08% to $23.83. Figure 2 below is a chart showing the price trend of UNG over the past week. VelocityShares' 3x leveraged (UGAZ) and ProShares' 2x leveraged (BOIL) were seen down 0.23% and 0.24% to $30.14 and $20.98, respectively. Meanwhile, VelocityShares' 3x inverse (DGAZ) and ProShares' 2x inverse (KOLD) were seen up 0.16% and 0.28% to $102.65 and $21.84, respectively. Spot prices were seen mostly lower on Tuesday as well. The down day was led by West Texas. El Paso Permian was down $0.66 and Waha finished down $0.59. The Northeast cash market was strong for Tuesday in anticipation for some wintry weather and cooler temperatures. AGT Citygate finished up $0.34. The Rockies were the one other region that yielded positive numbers with Opal finishing at $0.07. Gains were limited despite a powerful storm system that's to bring snow and cooler weather with it. Forecast models continue to suggest a cooler weather pattern developing late April. 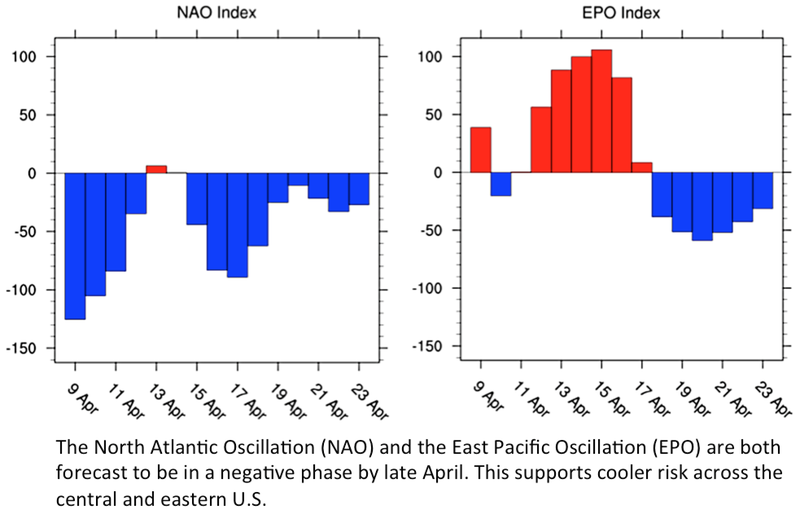 The North Atlantic Oscillation (NAO) and East Pacific Oscillation (EPO) both support that idea with a negative phase during that time frame (April 20-25). Figure 3 is a depiction of the NAO and EPO predicted phases over the two seeks. Figure 4 is a side-by-side comparison 850 mb temperature anomaly of the GFS and ECMWF ensembles in the 10-16-day time frame. Forecast models are projecting a cool mid to late April period. Injection season is in full gear and is off to a good start. Production and export still looks strong. Spot prices were weak on Tuesday. All of this taken into consideration, I still believe that the front-month May contract will trade within the $2.60 and $2.80 range. If forecast models continue to support cooler weather late April, I can see prices going a bit higher but still within range. I'm looking for UNG to trade between $21.00 and $25.60.